Quick and easy search for therapists! 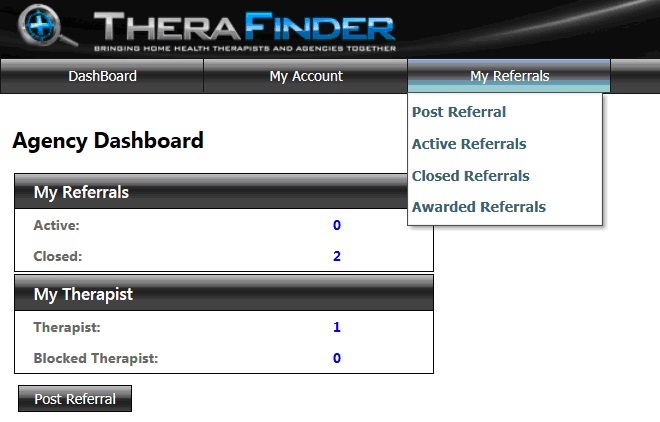 Instantly find out how many therapists and the type of therapists on the TheraFinder network service the zip code you need coverage in! Manage the status on all of your referral requests! From one screen you can manage all referrals active and closed. You will be notified when therapists respond to your newly posted patient referrals. Therapists: Reply to new referrals sent to you! Therapists have an easy way to respond to new referrals. Choose how you want to reply and add comments if needed. Therapists: Celebrate when you are awarded new referrals! 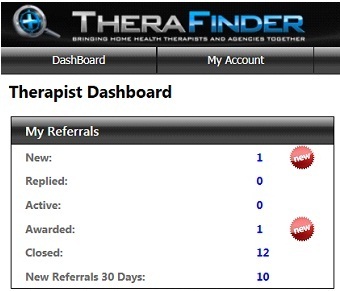 Therapists will be sent email notification when a new referral is sent to them from the TheraFinder network. Easily manage your new and awarded referrals from the dashboard! For TheraFinder pricing options, please click on the PRICING page. Month to month subscriptions are available or lower your cost even more with discounts for 12 month subscriptions or with a subscription to TheraTracker. If you have further questions, please CONTACT US and we will be happy to assist you!